If this ad featuring Scarlett Johansson looks a tad familiar, congratulations! You are a true fashion historian, as well as, most likely, a classic movie fan. At first blush—yes, we just went there—this ad for Dolce & Gabbana foundation appears to showcase a fresh, natural look. Technically, it does. But look closer, young padawans—note the strong eyebrow, the slightly winged eyelid, the long, blond hair, the mouth that is both smiling and pouting. Someone—and by someone we mean some Francophile at D&G—just might be trying to channel a bit of Catherine Deneuve into our ScarJo. Not that we’re complaining. Even when she’s just wearing a bed sheet, (and, we presume, a whole lot of foundation), the girl looks fantastic. Scarlett is featured in the latest OK magazine, which is their “Hollywoods Hottest Bodies 2012” issue. I added a small scan to the gallery. 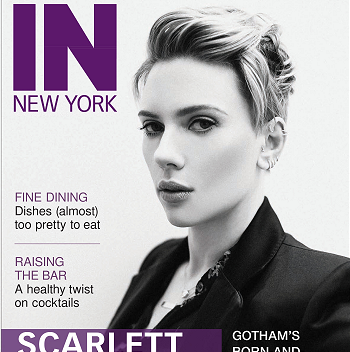 I added scans of Scarlett’s appearance in “Easy living Magazine”. The photoshoot can also be found in the gallery, this was added a few weeks ago. Thanks to Claudia at Incredibly Downey Jr. I added scans of “The Avengers” in Sfx magazine, the September 2012 issue. Enjoy! Posted on July 23, 2012 Written by IsabelleComments Off on Introduction + additional event HQs! Introduction + additional event HQs! Hello fellow Scarlett fans! My name is Isabelle, and I am a new co-web here at Scarlett-Fan.Com. I’ve been a fan of hers (as well as this site) for many years now, and I’m very exited my good friend Aniek let me join her here at the site! I’ve been running fansites for quite some time now, and run sites like Alyssa Milano Online, I heart Evangeline, Glistering (AJ Cook) and Sassy! Sarah Michelle Gellar. For my first update here, I’ve added some additional, jaw-droppingly gorgeous photos of Scarlett at this years Costume Institute Gala! Scarlett looked as fantastic as ever, and the photos are a sure must-see for all fans. Check them out, and enjoy! Posted on July 22, 2012 Written by AniekComments Off on 2012 Magazine Scan update! I am rounding up my huge gallery additions by adding all kinds of magazine scans from 2012 to the gallery. Yet again a big thanks to DeAdele from Ryan Reynolds fan for donating! Check them out!!! Enjoy. I completed the 2012 photoshoot section today. I added HQ images of the Vogue shoot Scarlett did in May in HQ! I left the MQ’s there, since I spend a few bucks getting them. Again a big thanks to DeAdele from Ryan Reynolds fan for donating! Thanks to DeAdele from Ryan Reynolds fan for donating tons of magazine scans to the site. They were all added to the gallery. Check them out by following the links below. Thanks a bunch to DeAdele from Ryan Reynolds Fan for donating tons of Scarlett pics! I am busy adding new/more pics to her modeling section in the gallery. Check out some of the first additions below. I added a few missing photoshoots to the gallery today. First, I added 6 pics to the 2011 shoot of Marie Claire Magazine. Second, I added a beautiful shoot Scarlett did recently: the Vogue shoot in may 2012. This is the first shoot of 2012 I could find. The gallery layout was also made with this shoot. Hopefully more will follow. Enjoy!